This sophisticated, gold-flecked reusable cork tray comes packed with gourmet snacks. We've included everything you need to serve appetizers, from baguette crisps to artisan meats and cheeses. We've even included sea salt caramels for a sweet contrast. 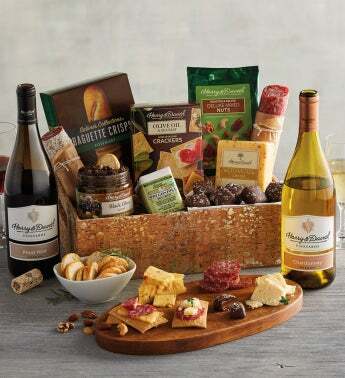 This delicious selection pairs beautifully with a bottle each of Harry & David™ 2015 Pinot Noir and 2017 Chardonnay. The tray will come in handy for years to come long after the treats have been savored.